There’s an interesting duality that attends cusp figures. Do they belong to the coming world, the one which their own arrival heralds and brings forth? Or do they carry continuities, seeds of the past, within them? Nagavara Ramarao Narayana Murthy—the iconic 70-year-old who gently declared his willingness to be President of India if everyone agreed, around the time of his retirement from the company he founded—is one of those of whom this and many other questions can be asked. And have been asked. But only certain people set themselves up to such aspirational standards that such questions even arise. India’s emergence as an IT giant in the 1990s, albeit more as a services outpost than as knowledge hub, was something that changed the very nature of its presence in the world. As if it had leapfrogged straight from the Third World to a post-industrial one. Across the Big Pond, an IIT grad popped up in Dilbert. Back home, they all went to Infy. The story is a much-narrated one. 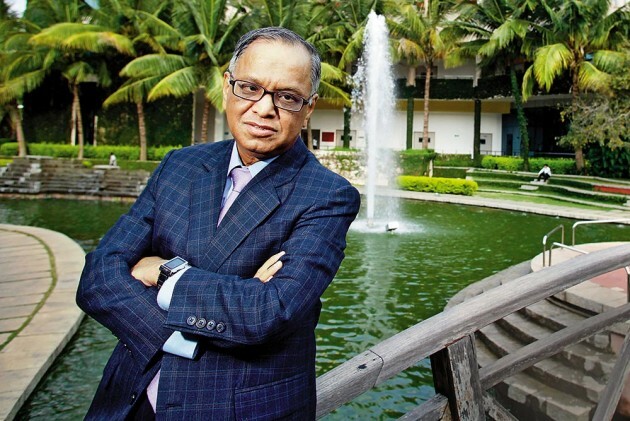 After a BTech in electrical engineering from NIE Mysore, and masters from IIT Kanpur, Murthy started as chief systems programmer at IIM, Ahmedabad, working on the installation of a time-sharing computer system, the third institute to have one after Harvard and Stanford. An overseas stint, and Murthy was back to realise his dream. He co-foun­ded Infosys in 1981 with and served as CEO till 2002—two epochal decades, towards the close of which he had turned Infy into a collective dream. A badge of honour for a born-again nation, a talisman. Later, he took on a pro­gressively eminence grise role, but a paternal reluctance to let the child falter on missteps was visible in recent dabblings. Critics asked: for a firm that swore by mer­i­tocracy, why the lingering trouble with “pro­f­essional leaders”, that echo of family business? But Murthy was int­ervening for rectitude and transparency. Piqued by his critiques, Chetan Bhagat once spoke of “body shopping” and an IISc scientist asked what of value had Infy ever produced. Well, if ‘software’ can met­a­phorically connote intangibles, like the idea of a new India, there’s an answer.